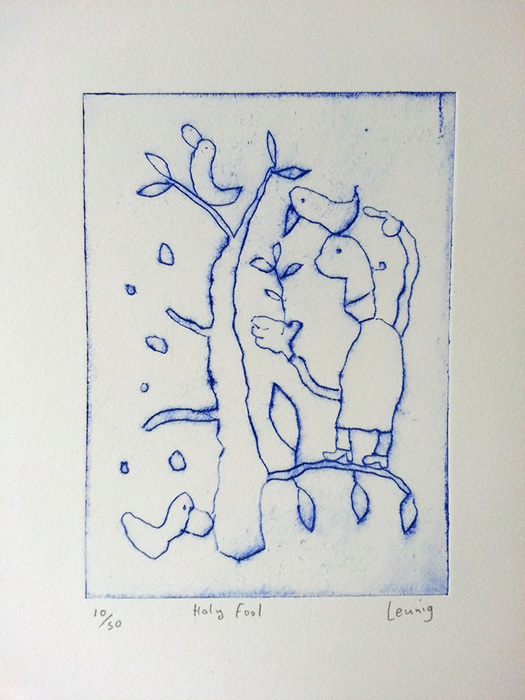 New release limited edition etching engraving print run of 50 and only $500, this will move quickly, classical Michael Leunig titled Holley Fool etching is handmade and a fine art print depicting – Leunig, the duck, birds, the tree, this Holley Fool series is one of Leuing’s special series that has brought delight to many who have read his book Holley Fool. Holley Fool limited edition fine art print at Etching House November 2013. Holley Fool edition 50 only, image size is 15cm x 11mm, sheet is 315 x 250mm.